The Acura TSX was introduced in 2004 and ran until 2014 as a sporty sedan that appealed to families looking for a bit more luxury than the average four-door. It offered a high-quality interior, renowned Acura reliability, and a wide range of standard features for the base price. The most recent generation of the TSX debuted in 2009 and premiered a roomier cabin along with a new, edgy exterior styling. Like all Acura vehicles, the TSX is known for its top-notch reliability and longevity, and at acurapartsnow.com, we want to help you keep your TSX running in the best condition possible. 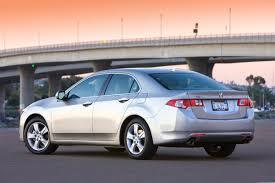 That's why we offer genuine parts for your Acura TSX like oil filters, belts and wipers. You can search our catalog for these parts and more by entering a keyword, part number or VIN. We also have a convenient drop-down if you want to choose your Acura vehicle's year and model. If you can't find the Acura TSX parts you want or have any other questions, then our parts team is standing by to assist.